You can create a reminder for each time tracking entry, e.g. call again. Click the InLoox PM tab on the Outlook Ribbon, then click Time Tracking. In Outlook 2007, click InLoox PM Folder in the InLoox PM Toolbar and then Timeline in the InLoox PM project list. Choose an entry from the Time Tracking list. In the Start tab, in the Actions group, click Create Reminder. In Outlook 2007, click Create Reminder in the InLoox PM project list. 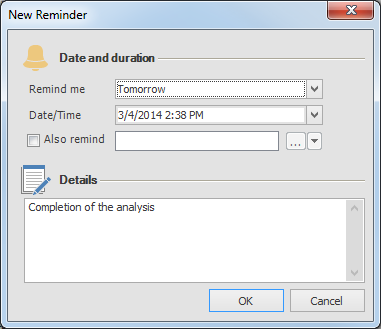 In the Date and duration area, choose from the Remind me drop-down list an option. In the Date/Time box, choose the date and time for the reminder. Activate the Also remind check box. Click and choose from the Select Contact dialog box a name. In the Details area, type additional notes. Now, you can see the new reminder in your Outlook calendar at the time you have entered. How to set a reminder for existing time tracking entries | InLoox PM 8 • Copyright 1999-2019 © InLoox, Inc. All rights reserved.